Does your kid think she has something better to do than practice math? How about fight crime? 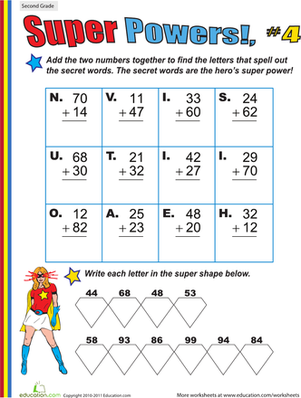 Help her get a grip on her two-digit addition skills—and a super power at the same time—with this dynamic worksheet. Answering this slew of math problems will lead her to uncovering this hero's unique power ... and strengthening her mental math skills! 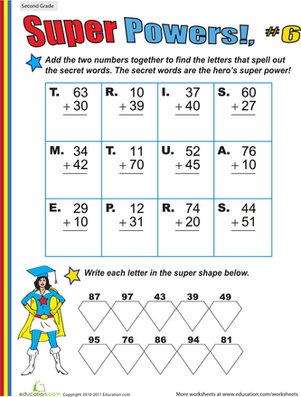 Check out the rest of the worksheets in this addition set for more math practice. Is your second grader struggling with two-digit addition? 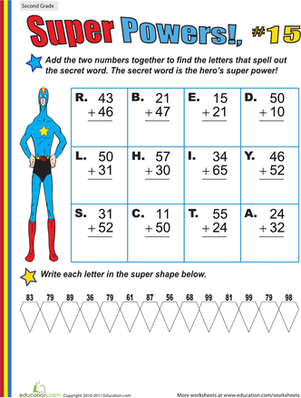 This super hero worksheet should motivate him to practice math! 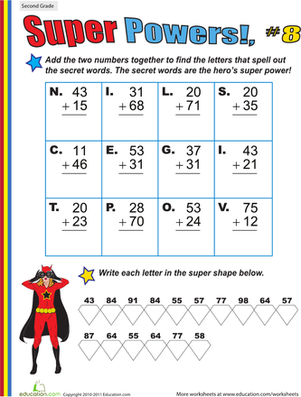 Your second grader will finally want to practice at-home addition when it involves super heroes and extraordinary powers! 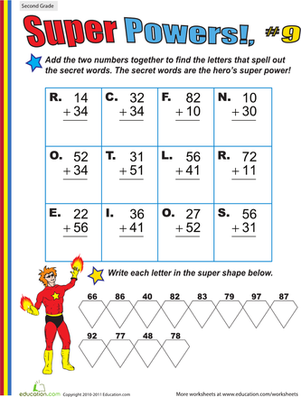 Spark your second grader's interest in practicing math with a two-digit addition worksheet--complete with a super hero and his special power! 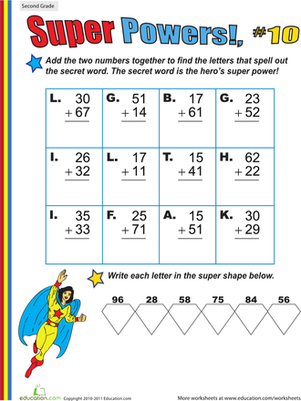 Give her a helping hand with this super power-infused, two-digit addition worksheet. 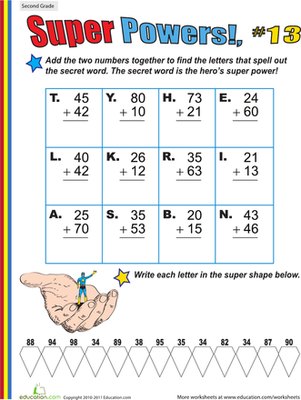 Looking for a fun way to boost your second grader's two-digit addition skills? 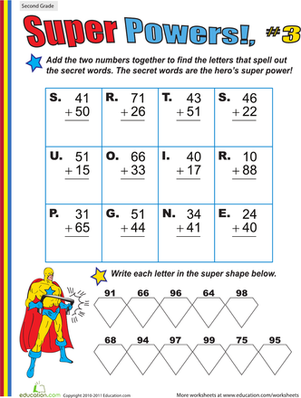 This super power-infused worksheet will actually motivate her to practice math. 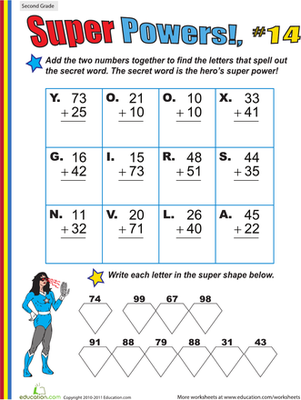 Guide your second grader through this fun, two-digit addition worksheet to boost her mental math skills. 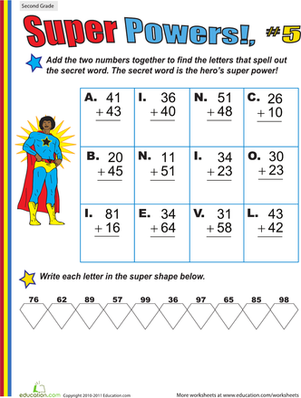 Two-digit addition troubling your second grader? The only way to get the concept down is practice, practice ... and more practice! 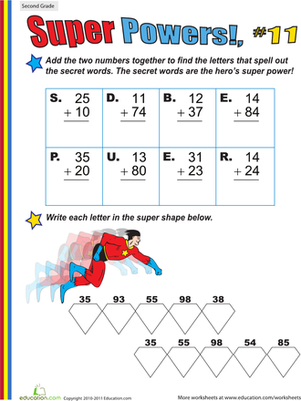 While your second grader may not learn super-human abilities with this fun worksheet, he may gain exceptional addition skills! 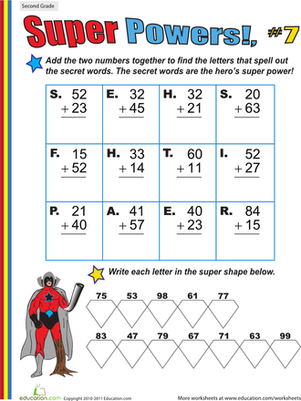 This addition worksheet--embellished with a powerful super hero--does the trick!